The Purple One's Apple Music absence now makes sense. When Prince’s catalog didn’t appear on Apple Music on the streaming service’s launch day, it seemed a little strange. The Purple One’s albums were available on Spotify, Tidal, and other competing services, so why not Apple Music? 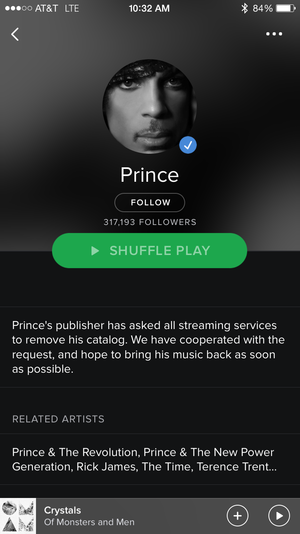 The space where Prince’s music catalog once streamed on Spotify is now blank. Prince isn’t just shunning Apple. He just pulled his entire catalog from every service but Tidal and Google Play. There’s some speculation as to whether Google will also take down Prince’s catalog—we’ll update this story if that turns out to be the case. But Spotify, Rdio, and Deezer have all complied with takedown requests from Prince’s camp, so if your playlists were funk-heavy, you might be outta luck unless you join Tidal. 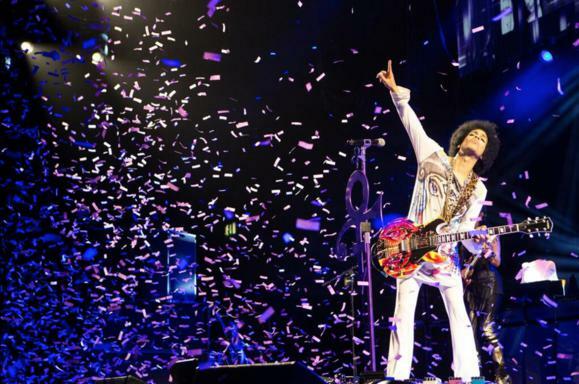 Prince went all in with Jay Z’s premium, artist-owned service in May, using it to stream his Rally 4 Peace concert in Baltimore in the wake of Freddie Gray’s death. The singer then posted the full recording of that show on Soundcloud. Prince is still a fan of Soundcloud: He posted a new song, “Hardrocklover,” to the site the same day he bounced from Spotify. Why this matters: Prince has a love-hate relationship with the Internet, last year quitting Facebook, Twitter, and YouTube. He has also supported Taylor Swift’s criticism of freemium streaming services. That’s why the Apple Music stance is a little peculiar—like Tidal, Apple’s streaming service requires a premium subscription and doesn’t offer an ad-supported version (though it’s currently offering a free 3-month trial). Prince hasn’t yet weighed in to clarify his decision, but we bet there’s some serious behind-the-scenes deal-making going on right now.